CZ Black & Clear Round Motorcycle Stickers. 1.25", 2.5" or 4" Pair. CZ Black & White Round Motorcycle Stickers. 2.5" Pair. CZ Blue & White Round Motorcycle Stickers. 2" or 2.5" Pair. CZ Česká Zbrojovka Czech Flag Style Stickers. 2" Pair. CZ Czechoslovakia Flag Style Stickers. 2" Pair. 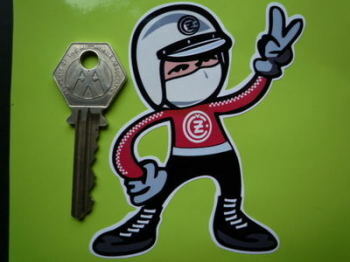 CZ Motorcycles Flag & Scroll Sticker. 4". 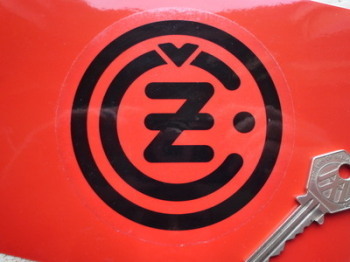 CZ Red & White Round Motorcycle Stickers. 2.5" Pair. CZ Rider 2 Fingered Salute Sticker. 3.5". Jawa Czechoslovakia Flag Style Stickers. 2" Pair.